Our 6 piece Micro Carving Set is made of the finest quality high carbon tool steel, fully sharpened and honed to an incredibly sharp edge. You'll be amazed at the intricate cuts possible. These tools are a must if you're into anything that requires small, intricate cuts in wood...decoy carving, ship modeling, dollhouse miniatures, etc. 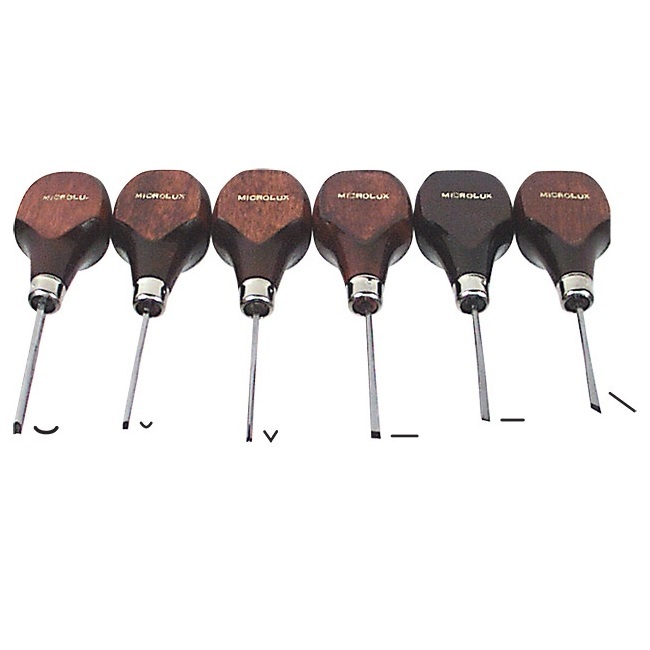 Carvers have lacquered hardwood handles and includes one each: 7/64” and 5/64” gouges, 5/64” V-shape parting tool, 1/8” single bevel chisel, 1/8” double bevel chisel, and 1/8” skew chisel. Approximately 4-1/4 inches long. .